There was a glorious end to an era as Peterborough Islanders captured more silverware yesterday (April 23). 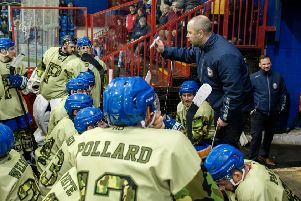 The city side completed a National Ice Hockey League Division Two South treble by adding the play-off crown to a collection which also includes the East Division title and the League Cup. Islanders triumphed 13-6 on aggregate against Chelmsford Warriors with the damage being done by a 9-1 success in the first leg on Saturday (April 22). Stevie Johnson’s men were actually pipped 5-4 in the return clash at Planet Ice, but that result did little to quell the celebrations at the end of their final game before moving under the Phantoms’ banner. Nathan Pollard and Clint Herring both struck twice in the thumping road success. Leon Groom, Conor Pollard, Connor Stokes, Ken Bavin and Deivid Cetvertak also lit the lamp. Cetvertak, Stokes, James White and James Pentecost scored in the second leg.